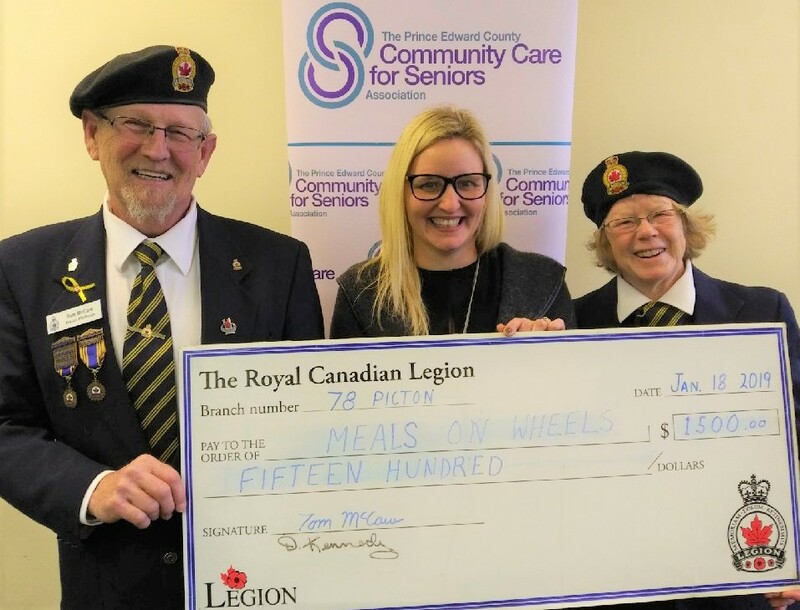 Continuing a long standing tradition of support, the Royal Canadian Legion, Branch 78 Poppy Fund donated $1,500.00 to support Meals on Wheels. Since 1980, when Meals on Wheels were first delivered in The County, Branch 78 of the Royal Canadian Legion in Picton has been there to help seniors living in this community. On hand to present a cheque for $1,500.00 from the Poppy Fund was Tom McCaw, Chair of the Poppy fund and First Vice President of Branch 78; Diane Kennedy, President of the Picton Legion. Teresa Shephard, Co-ordinator of Community Care, accepted the cheque. The Prince Edward County Community Care for Seniors Association began delivering Meals on Wheels in 1980. Besides Meals on Wheels the agency offers other services such as transportation to medical appointments, noon-time dinners for seniors, foot care, help with forms, respite, home maintenance, rural route reassurance and telephone reassurance programs and the County Seniors Centre. The agency is partly funded by the Ministry of Health & Long-Term Care through the Local Health Integration Network and the Ministry of Seniors Affairs and Accessibility. A large part of the budget comes from donations and community fundraising efforts, such as Community Care’s Thrift Shop at 153 Main Street in Picton. Photo cutline, L-R: Tom McCaw, First Vice President and Chair of the Poppy fund; Teresa Shephard, Co-ordinator with Community Care; Diane Kennedy, President of Branch 78.